(*) Became members of the Capt Arnold S. Litman Crew on 13 Dec 44. 2Lt Lester A. Lake, Jr. (P) - Upgraded from CoPilot to Pilot on orders dated 26 October 1943 and flew his first of 14 credited missions as First Pilot on 26 November 1943. Combat tour completed on 29 January 1944. 2Lt Arnold A. Litman (CP) - Upgraded from CoPilot to Pilot on mission #88 13 Dec 44. Became a Lead Crew Pilot on mission #109 20 Feb 1944. Completed combat tour on 18 Apr 1944. Volunteered for a second combat tour as a Lead Crew Pilot on 17 July 1944. On 10 August 1944 Capt Litman (P) and 2Lt G.L. 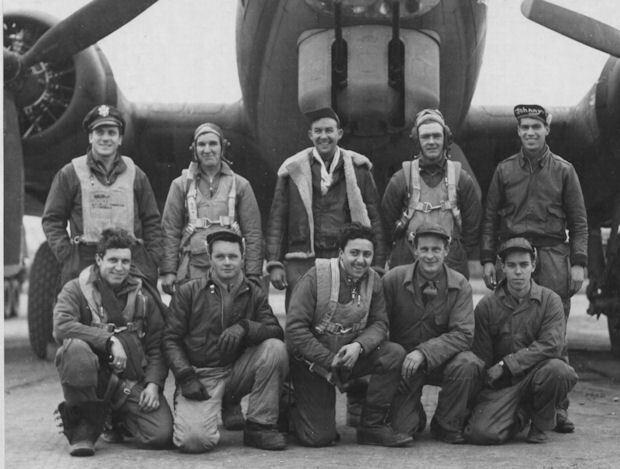 Conley (CP) were on a local transition flight in B-17 #42-97298 The Floose with a six man crew. The Co-Pilot was practicing landings and made a hard tail-first landing. Capt Litman immediately applied full power and went around for another approach. The tail wheel was inspected and was found to be damaged. Capt Litman then made a wheels first landing, the tail wheel collapsed when it made runway contact, and the tail was dragged long enough to clear the runway. Capt Litman was an Evadee on the 15 August 1944 mission #229 to Wiesbaden, Germany in B-17 #42-37838 Fearless Fosdick (358BS) VK-A. His B-17 went down in flames after a flak hit in the nose that mortally wounded the Bombardier (1 KIA & 8 Evd). 2Lt Lawrence C. Merthan (N) - Became a lead crew Navigator. 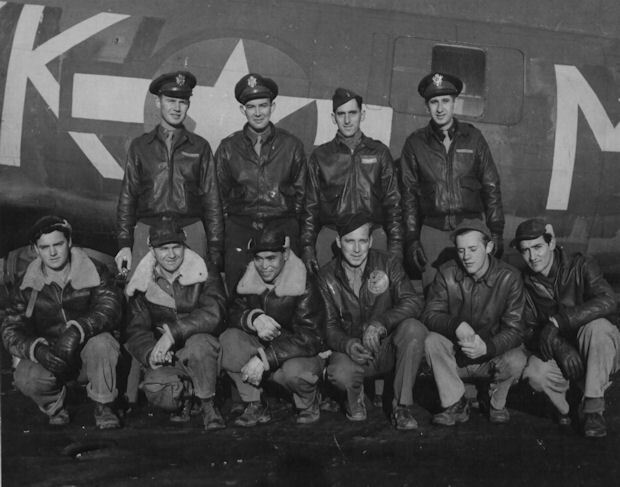 2Lt John G. Leverton (B) - Became a POW on 11 January 1944 mission #98 to Oschersleben, Germany (2Lt Jack W. Watson Crew) in B-17 #42-29524 Meat Hound (358BS) VK-K (4 KIA, 3 POW, 1 Evd, 1 Returned).